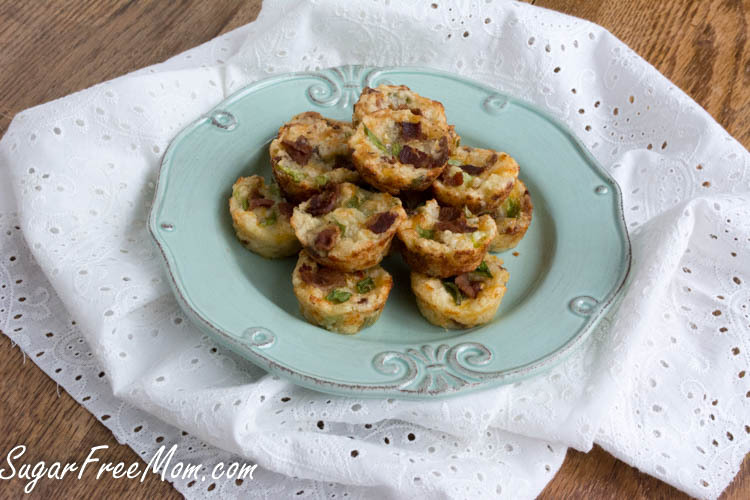 Cheddar Cauliflower Bacon Bites are the perfect healthier appetizer for all your holiday entertaining or an easy weeknight side for the family! Entertaining during the holiday season can be a downfall when you’re trying desperately to watch your weight and eat healthier. Forget trying to lose weight, I’m talking let’s just maintain status quo, right? 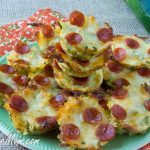 The biggest trouble I find is all the picky finger foods! I could eat my weight in those alone just by gabbing and grabbing. The next thing I know I’m full before the party begins or the sit down meal starts. 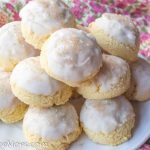 I’ve made this recipe quite a few times, changing it and tweaking it along the way for my family. I remember the first time I made them, they were more like fritters which I adapted from my Zucchini Fritter recipe. I thought it would be the only way to fool my kiddos into eating cauliflower. And I was right! They never saw it coming. SO I made them quite a few times as a fritter but wasn’t quite happy with how hard it was too cook them in a saute pan and flip them over. Quite flimsy and difficult. I thought, if I’m having trouble flipping these babies no one else will like that either despite the fact the taste is outstanding. I tweaked the ratio of flours a bit, trying different kinds each time and reducing egg and cheese, it was a science experiment every time, but each time, my family ate them all up no matter how I made them. 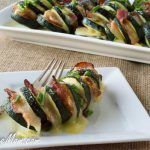 I decided……well, actually, credit must go to the hubby on this one who said, “just bake them like you do with those zucchini bites you’ve made before.” And he was right. Worked like a charm, no flipping, no frying, easy peasy easy! You might be able to sub the gluten free flour for quinoa as I did in my Broccoli Cauliflower Quinoa bites, although not sure if they would hold as well like the flour but it’s worth a try. 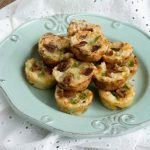 These are a win for the family and a great alternative at the holiday appetizer table! You can eat 6 per serving for only around 200 calories, and gluten free as well. You could use regular flour if gluten is not an issue for you. Enjoy!! Please note: I re-calculated my nutritional information as saw a difference in using Bob’s Red Mill All purpose gluten free flour compared to their new 1 to 1 gluten free flour. The difference in one cup is 88 grams of carbs to 120 grams of carbs. Also the calories for the 1 to 1 are 520 in one cup and using the all purpose it is only 400. On 12/4/14, I readjusted the calculations using the regular all purpose gluten free flour instead of the 1 to 1. UPDATE: I removed the gluten free flour and now use coconut flour, tastes just as good! Steam cauliflower until fork tender. Cool then add to food processor. Transfer to a large bowl and add the rest of the ingredients. 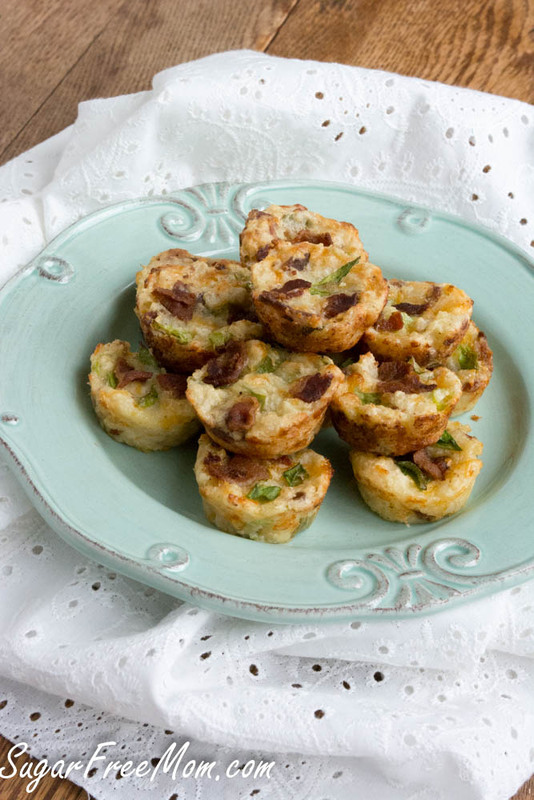 Fill mini muffin cups by adding a heaping tablespoon of batter and pressing into each cup. Fills 30. Bake 15 minutes and let cool about 10 minutes then remove from pan. 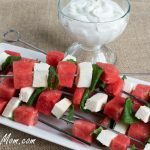 Such a great party appetizer! So clever, and they sound amazing! I am so intrigued by these little bites! Cauliflower is one of my favorite vegetables and I’m pretty sure I’d have to eat a least a dozen of these in one sitting. 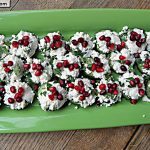 Looks like a great appetizer for a holiday party! I’m not sure I could stop at 6 of these! They sound completely delicious. You had me at “bacon” 🙂 SO gonna try this for the holidays. I love trickin the kids. These look great and the kids in my life would love them. It’s like you know me and my daily struggle to hide veggies wherever possible. I swear. The other day, I tricked my daughter into thinking carrots were sweet potatoes and just got over a battle of how all green vegetables are disgusting. I will definitely be making these for her (and for myself!). I can not wait to try these. They look so good. 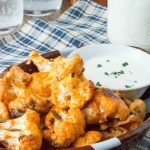 I adore cauliflower and appetizers. This recipe has my name written all over it! There is bacon and there is cheese, so add as many vegetables as you please. I’ll still eat away! Way to go, mom, for fooling the kids! Ha! Good job on these and I now I’ll be making these soon to add a little variety to my side dish game at dinner time. 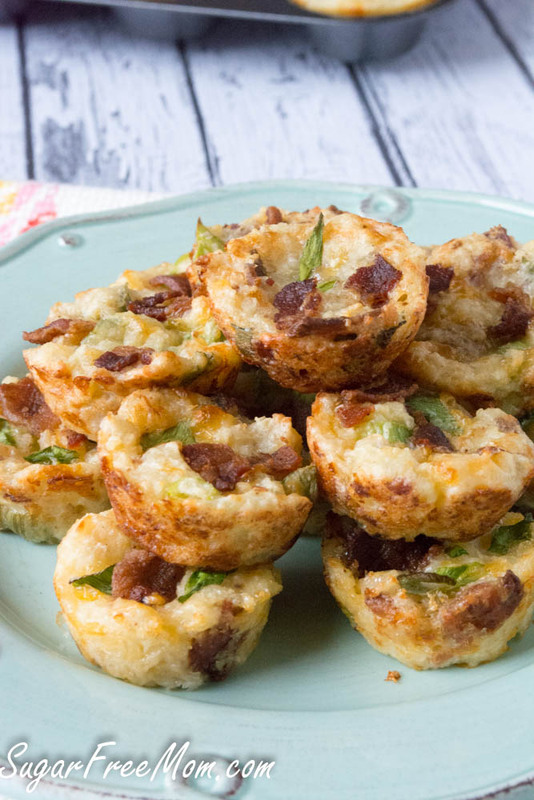 OMG these look awesome – kind of like tater tots but way better. These are wicked cool. And kudos for getting hooligans eating cauliflower. I hated it until I hit adulthood, now I love the stuff. These look great! Perfect appetizer! 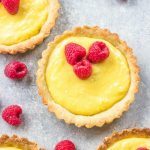 the recipes on your blog are great and this one definitely is a good one! 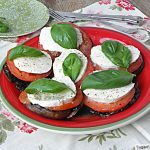 Wonderful recipe… perfect appetizer for upcoming parties! Love to try this recipe. What would u suggest for alternative other than bacon? My family doesnt eat bacon. You could leave it out and they would still be tasty! You could use ham, sausage, ground beef….the possibilities are endless! What would you suggest alternative other than bacon? Just started gluten free diet. I did not know there was a gluten free flour. Where do I find it. I use Bob’s Red Mill All purpose Gluten free flour, you can find it at most markets or online. I don’t think coconut flour would work, they might become super dried out, why not try almond flour. Hi. I have a question…can AP flour and gluten free flour be substituted 1:1. I’m excited to try some of your recipes. In this recipe you can, but not always in baked goods. My daughter might just eat these. I am always looking for new ways to get her to eat veggies, besides cucumber! Can they be frozen and reheated? Just wondering if these hold up well the next day.. reheated or eaten room temperature? (thinking of bringing them to a family get together but there’s 1h + traveling and such involved). I don’t personally eat low carb or vegan but a large chunk of my extended family does, so I’m excited to try some of your recipes out! That’s great I wish my extended family did, I’m the only one! 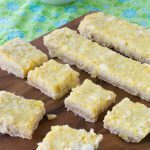 Just made these and all I could taste was coconut – it was overwhelming. 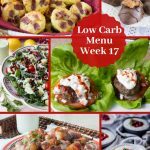 I don’t have to have GF food, but I am looking for low carb. Do you think almond flour would work? Yes I think you could sub almond flour. Can you use frozen cauliflower, or would it be too wet? Thanks. You can, but I’d probably thaw and squeeze out as much liquid as you can. 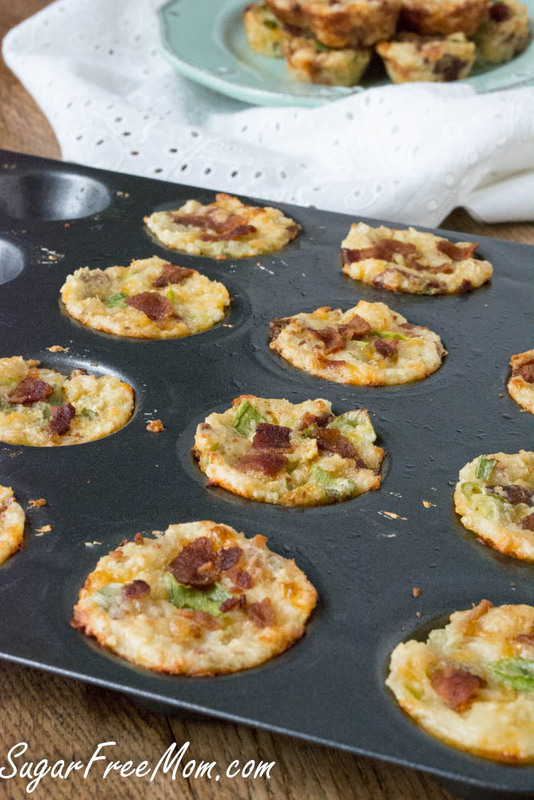 These sound great…I have leftover riced cauliflower but I hadn’t steamed it before putting in food processor. Should I steam the diced cauliflower before carrying out the recipe? Thanks! You don’t need to steam it, just thawed if frozen.